On my 5 bolt conversion I'm getting a new early 944 MC from Paragon. What is the best way to convert from the diagonal split the the front back split? I don't have a salvage yard or parts 944 available. Our extensive data on the conversion doesn't cover this too well that I could find. Run new lines or get used ones unless you are able to cut & flair your own lines. There's no easy option, the splitters aren't close enough to just swap lines around. I believe you want to run your front brakes from the master outlets closest to the firewall, and the rear brakes from the master outlet closest to the front of the car.. Pretty much just run 2 lines from the "front" (closest to firewall) outlets on the MC, 1 each to each front caliper and 1 line from the "rear" side of the MC to the back of the car and then split it to the 2 rear calipers..
All the line fittings are m10X1.0 thread and euro bubble flanged iirc, special/different flange tool..
Don't concern yourself with the master front/rear piston sizes as they have no effect on brake bias whatsoever. Only the "front" (closest to firewall) piston is pedal driven and is the only one responsible for driving brake fluid volume and pressure. The "rear" piston simply floats and its size is tuned to the difference in f/r caliper volume to best keep one circuit working if the other fails, it also physically separates the 2 circuit's fluid for fail mode.. If you are running any OEM combination of 931 944 951 f/r calipers your bias should be correct/close besides the difference in the weight f/r of the car they came from. Recommend you refer to the 924 tech section for the correct answer. Might not be the "correct" answer here, but why don't you try it first just as it is with the existing MC and X split. I did and found no need to change anything. IIRC the stock early ones on the 77 are actually a VW part and 22mm dia. It gives a greater mechanical advantage. Guess you may still have the smaller 7" booster too. I`m using the later 9" booster and by only changing to the (early) 944 brakes found such a dramatic difference. With all in good shape and properly bled of course it pulls up dead straight & even and incredibly quick. Heavy pressure on the pedal will lock the front wheels first and a bit more will lock all 4, and thats with 215/255 rubber. Can always go to lots of trouble to change over all the lines and MC but I found no need to. Works & stops so well as it is. 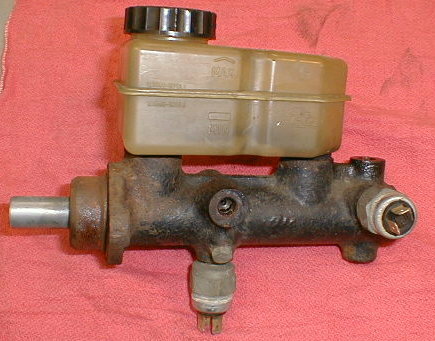 In the 924 and 931, the master cylinder has the same bore size for each circuit, and the front and rear calipers use different sizes to achieve the correct proportioning. The 944 uses a master cylinder with different bore sizes front and rear - since the fronts and rears are on distinct circuits. Therefore, for a given amount of pressure on the brake pedal, a 924/931 will develop identical pressure on all four corners, whereas the 944 will develop more pressure up front than at the rear. This is a common misconception and I see it has even found its way into the tech section. I hereby challenge this misinformation and move to have it corrected.. The stepped tandem MC does not affect the bias. Stepped tandem MC's generate the same pressure in both circuits. The stepped MC is to match the VOLUME requirements of the different circuits. This diagram shows the pressure relationship in more detail. Note that the diameter where the rear piston is acted on by the front circuit pressure and the diameter where the rear piston generates pressure in its own circuit are identical. So you have exactly the same bias as if you were running a 944 or 951 MC. The main master cylinder piston for the front brakes side is responsible for generating the pressure for both circuits. The smaller rear brakes circuit piston is not directly attached to the brake pedal but rather is acted upon by the pressure generated by the main front brakes master piston. The master cylinder really only has one master piston for the fronts and a separate (secondary intermediate semi sprung floating slave piston) that transfers the same pressure through to the rears. The point of the secondary piston is only to separate the hydraulic circuits in order maintain one side or the other if one circuit fails/leaks for safety purposes. This automatically adjusts for the volume requirements of each side with the second piston transferring the same pressure but it is free to move at whatever distance it takes to bring the rears up to the same pressure as the fronts therefore automatically compensating for the different volume requirements between the fronts and rears by having a non-fixed stroke. This will work/act exactly the same as having both front and rear circuits on the same master piston/cylinder but serves the purpose of separating the hydraulic circuits for safety in case of failure on one side or the other. The reason for the two pistons is to split the circuits. In normal operation the rear piston does nothing. If the front circuit leaks then the front piston MECHANICALLY drives the rear pison and partial braking is maintained. If the rear circuit leaks then the rear piston hits the end stop and the front circuit is still effective. The staggered bore is to make sure that this only happens when required...which depends on volume/compliance of the individual circuits (which is affected by piston size = bias). So a particular bias requires a particular staggered bore - but staggered bore doesn't change the bias. The 924-931 have X split, 1 front and 1 rear caliper on each circuit, therefore the same caliper volume requirements for both circuits, therefore both MC pistons are the same size.. The 944 and on are F/R split, 2 fronts on one circuit and 2 rears on the other circuit, the front calipers have larger pistons which requires more fluid volume than the rear calipers circuit, therefore the stepped bore sizes are tuned to different sizes for the best operation of the remaining circuit if/when the other circuit fails.. In summary, the stepped pistons have no effect on brake bias, rather it is the difference in the brake bias (volume requirement) between the 2 circuits that require the stepped master in order to maintain the best function of one circuit in the event of a failure on the other circuit.. If you want to run a non stepped MC on an X split it will always be correct no matter the caliper sizes because you have one of each on each circuit and the same volume requirement on each circuit. If you want to run a stepped master, and want the failure mode to work correctly, then you need to run the calipers that are matched to that MC, and run F/R split. If you run a stepped master in X split it will not effect your bias in any way but the failure mode will not be tuned correctly to the calipers and fail mode may not function properly on one circuit or the other, or both.. If you want to run a non-stepped MC on F/R split it will not effect your bias, but again the failure mode may be tuned incorrectly and may not function properly. Do ya get it? Your messing with your fail mode here and not your bias..
why don't you try it first just as it is with the existing MC and X split. Yeah, unless you want to install and adjustable bias valve (proportioning valve) then you should be fine with the X split. If you want a stiffer pedal with less travel you can keep the X split and move to a 931 MC with a bigger MC piston and fail mode will operate correctly. If you want to run a prop valve then you need F/R split (to isolate the rears), you can do this on any MC but fail mode will not function correctly unless it is the matched MC for the caliper set.. If you want fail mode to function correctly, you either need to stick with X split and a non-stepped MC (any calipers), or you need the correct/matched stepped MC for the calipers and run F/R split..
Also four wheel disk was an option on both 924s and 931s. There was no change in the split on these cars and Porsche had no problem with selling them. I see no reason why changing the calipers would be a problem since it was done by the factory. The difference was in the master cylinder sizes between the disc/drum and the 4-wheel disc cars. Check PET and you'll see the part numbers. But Stefan, master cylinder front/rear piston sizes have no effect on brake bias whatsoever. Yes I know. I haz a dumb. Well if you cannot look at the MC diagram I posted and understand my explanation I'm sorry.. Do your own research, look it up yourself. If not then go ahead and set up your cars with imaginary bias changes, be my guest..
Why do you think Porsche set the 951 up with a stepped master AND a prop valve? Did they just get lazy and just put a bandaid on it? I think not.. The difference between the FRONT piston sizes in MCs effects brake pedal to fluid pressure leverage. Bigger FRONT piston makes for less pedal travel to push the same volume but more pressure needs to be applied to the pedal to get the same fluid pressure. Smaller FRONT piston = more travel to move the same volume but more leverage so less brake pedal pressure to reach the same line pressure. And that still has no effect on bias, just pedal pressure and travel vs line pressure.. There is only 1 master piston in these MCs, the "rear" piston is not a master piston, it is a floating piston. It serves to physically separate the 2 circuits and its size is tuned TO the bias, it does not tune the bias, the bias tunes it.. 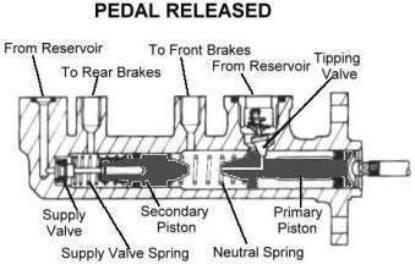 The brake pedal does not push the "rear" piston, fluid pressure from the "front" piston pushes the "rear" piston and transfers the same pressure to the rear circuit. If you want to tune your bias you can do that with a prop valve and F/R split, change your slave piston sizes (calipers) F/R ratio, or run 2 master cylinders..